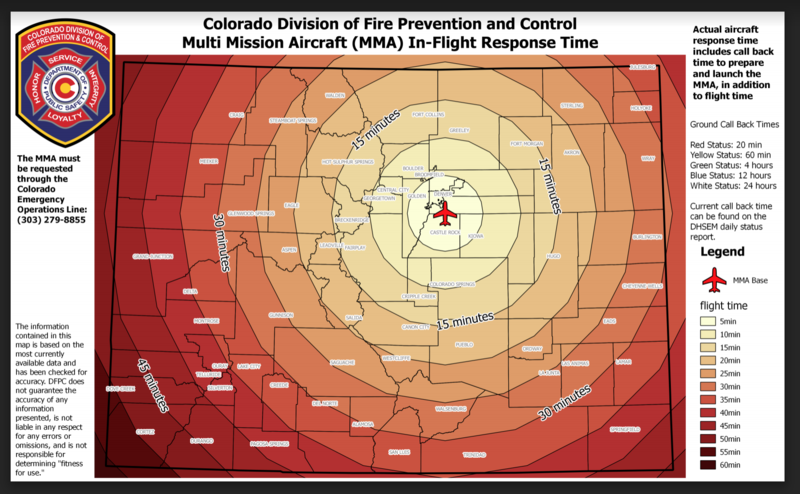 Colorado's Multi-Mission Aircraft (MMA) program is comprised of two Pilatus PC-12 airplanes outfitted with state-of-the-art infrared (IR) and color sensors (EO) operated by sensor operators from the Division of Fire Prevention and Control Wildland Fire Management Staff. The PC-12 is a high performance turbo-prop aircraft that can cruise and work safely at altitudes above 20,000 feet. Based out of Centennial, CO the PC-12 can takeoff and be over a wildland fire almost anywhere in Colorado in less than an hour. The primary mission of the program is detection in addition to providing near real time information to ground forces during initial attack on wildfires. Incident Commanders can order these aircraft to detect and recon wildland fires and aid them in making sound tactical decisions, improving the safety and efficiency of the response. The MMA can also support other all-risk emergencies. The MMA is a complete system that provides critical intelligence, images, and communications capabilities. It is integrated with the Colorado Wildfire Information System (CO-WIMS), a geospatial database that displays incident images and details to local Fire Managers through a web based application.